Readers, colleagues, friends: it's finally happened. My first book is finally out in the world. It's available direct from Springer (the publisher) as an eBook or hard copy. You can also buy it at Amazon. Or ask your local independent bookstore to order it for you, and maybe a couple extra copies to stock while they're at it! 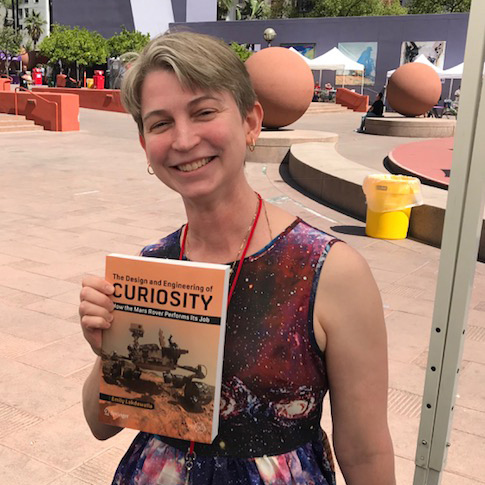 Emily Lakdawalla receives her first physical copy of her 2018 book The Design and Engineering of Curiosity. The book is available from Springer-Praxis, ISBN 978-3-319-68146-7. If you want a signed copy can can't make it to The Planetary Society's headquarters to have me sign yours, stay tuned for the opportunity to obtain a signed bookplate from us. For those of you who buy the book (thank you!) and enjoy it, I have a request: please do me the favor of writing and posting a review on Amazon and/or Goodreads. Do this for all your favorite authors -- it really, really helps not only to sell books but also to get publishers to produce more of the kinds of books you like. You can read a lengthy adapted excerpt of the book on the American Scientist website. I have a different excerpt for you here, which will demonstrate to you the exhaustive detail that I go into on how the components of the rover and its instruments work. Half of the book is structured in the same way as this section -- introduction, how the device works, and how it's performed on Mars. I selected this particular excerpt because it doesn't just apply to Curiosity; there will likely be three future MMRTGs on missions including Mars 2020. The excerpt is exactly as printed except that I've merged footnotes and references. 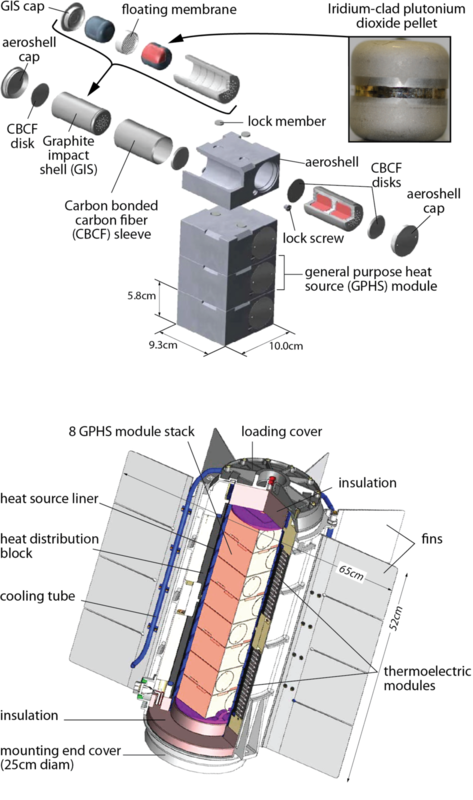 Curiosity draws its power from a Multi-Mission Radioisotope Thermoelectric Generator (MMRTG). (1) The MMRTG trickles the power that it generates into two rechargeable 42 amp-hour large-cell lithium-ion batteries. The MMRTG generates power using the heat from radioactive decay of 4.8 kilograms of plutonium dioxide (a ceramic form of plutonium-238), of which about 69% of the mass was radioactive plutonium-238 when it was first fueled on October 28, 2008. Plutonium-238 has a half-life of 87.7 years. Power production will decline over time, reducing rover activity. Once the MMRTG no longer generates enough power for survival and communications, the mission will end, probably by 2030, if nothing else ends it earlier. The MMRTG weighs 40 kilograms. A radioisotope thermoelectric generator converts heat into electricity with no moving parts by taking advantage of the thermoelectric effect. Holding two different electrically conductive materials at different temperatures and joining them in a closed circuit generates current. A pair of conductive materials joined in this way is called a thermocouple. A thermocouple has a “hot shoe” and a “cold shoe.” In Curiosity’s MMRTG, the decaying plutonium heats the hot shoes of the thermocouples. External fins splaying out into the Martian air chill the cold shoes. The plutonium dioxide ceramic is split into 32 pellets, each weighing 150 grams. Each pellet is clad in iridium. The iridium cladding is a safety feature that blocks the alpha particles emitted by the plutonium pellets. It also has a high melting temperature (2400°C), in case the cooling system fails. Upon landing, the MMRTG generated about 114 watts, ranging from 109 to 119 watts over the course of the sol. You might have noticed that this is more power than it generated when it was first fueled, while on Earth. The MMRTG was designed to operate at the lower ambient temperature on Mars, where there is a higher contrast in temperature between the hot and cold shoes of the thermocouples. It generates more power at night, when ambient temperatures are lowest. Over time, the performance of the MMRTG decays at a rate of roughly 1 watt per 80 sols. The plutonium decay is exponential – it declines more slowly as time goes on – but the MMRTG performance decay is close to linear. That’s because the thermocouples are also degrading, but unlike the plutonium they degrade faster with age. At the beginning of the mission, engineers estimated that the MMRTG would still be producing 54 watts 17 years after was fueled, on October 28, 2025, which would correspond to sol 4702. (6) Even with efficiency improvements, the rover’s activity will be increasingly energy-constrained with time. On sol 456 (November 17, 2013), the rover experienced a partially conductive “soft short” in the MMRTG, apparently caused by a part of the electrical power circuit touching the aluminum housing. (7) The Cassini spacecraft had MMRTGs of the same design, and experienced similar shorts. As a result of the short, the voltage difference between the rover’s power bus and chassis changed (from 11 volts to 4 volts on that particular sol). The rover’s power system is robust to such changes in voltage, having been designed with a floating bus. The mission halted activity for 6 sols to investigate the problem, which had spontaneously disappeared by sol 461. (8) It occurred again on sols 816, 1084, and 1158, and has been happening more frequently since. The soft short is annoying because it halts operations, but it does not threaten the health of the rover. (9) Table 4.1 lists all the soft shorts to sol 1582. Table 4.1. 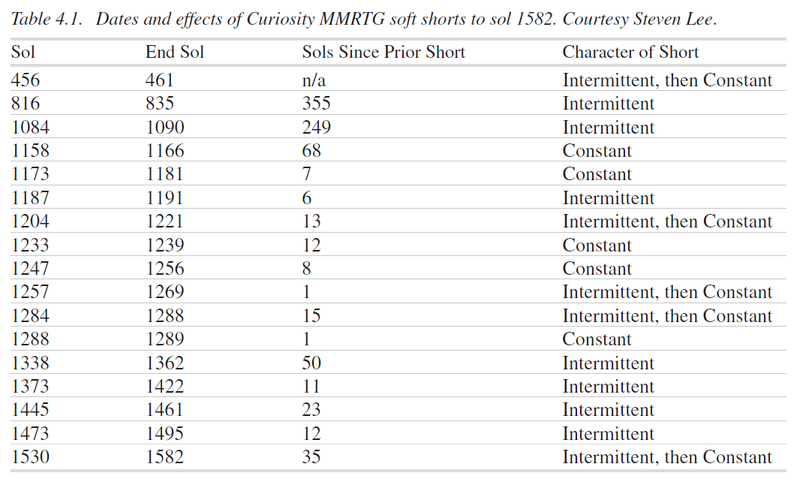 Dates and effects of Curiosity MMRTG soft shorts to sol 1582.
and Woerner D et al (2012) The Mars Science Laboratory’s MMRTG: A mission’s perspective. Presentation to AISS/ASME/SAE/ASEE 48th Joint Propulsion Conference & Exhibit and 10th International Energy Convers, Atlanta, Georgia, 29 Jul-Aug 1, 2012. (2) NASA Science Mission Directorate (2006) Final Environmental Impact Statement for the Mars Science Laboratory Mission. (3) Woerner et al (2012) and Woerner D et al (2013) The Mars Science Laboratory (MSL) MMRTG in-flight: A power update. Paper presented to Nuclear and Emerging Technologies for Space 2013, Albuquerque, New Mexico, 25–28 Feb 2013. (4) Gross M and G Cardell (2011) An overview of NASA’s Mars Science Laboratory. Paper presented at the 9th European Space Power Conference, Saint Raphael, France, 6 Jun 2011. (5) Welch R et al (2013) Systems Engineering the Curiosity Rover: A Retrospective. Paper presented at the 8th International Conference on System of Systems Engineering, Maui, Hawaii, 2–6 Jun 2013. (6) Woerner D (2014) An enhanced MMRTG for Exploration of the Outer Planets. Poster presented at the July 2014 Outer Planets Assessment Group meeting, Bethesda, MD, 23–24 Jul 2014. (7) JPL (2013a) Rover Team Working to Diagnose Electrical Issue. http://mars.nasa.gov/msl/news/whatsnew/index.cfm?FuseAction=ShowNews&NewsID=1559 Status report dated 20 Nov 2013, accessed 15 Aug 2016. (8) JPL (2013b) Curiosity Resumes Science After Analysis of Voltage Issue, http://mars.nasa.gov/msl/news/whatsnew/index.cfm?FuseAction=ShowNews&NewsID=1560 Status report dated 25 Nov 2013, accessed 15 Aug 2016. Congratulations, Emily! As a fellow book author, getting your hands on your first copy is genuinely exciting. Great job and best of luck.. Just need to figure out how to get a copy to the Curiousity...It would be good company on a cold Martian night sitting near its power module. Do you think that with falling launch costs we'll start to see a shift to cheaper, less power-dense isotopes like 90Sr or 241Am? Or even just larger solar arrays (which are in their own right rapidly dropping in mass per unit power)? Hi Emily, congratulations for your first book. I hope, one day, I feel that excitement !